It was my version of a Willy Wonka Golden Ticket. I got the call from my good buddy, Rob, 24 hours before the final game at this Welsh-Ryan Arena letting me know I was not only “in”, but I would be his guest, court side. You see, I had given up my season tickets for this season, inconceivable, I know, given my background. However, with three daughters in their prime activity years, my non-work hours are mostly consumed as a kids’ taxi service. The only thing worse, in my opinion, than not being a Northwestern season ticket holder, is being one who doesn’t fill the seats with purple. So, on this day, I was going to cherish OUR old barn. I got there five minutes before the doors opened, 90 minutes before tip-off, for one final time. Nearly 300-500 other people had the same idea. I came toting my Cannon camera, which had a video feature, so I could document my journey of the place that despite its relative lack of history of success for our Northwestern Wildcats, is (was?) our house. I wanted to visually capture every nook and cranny of the arena – its ridiculously tight hallways, restrooms made for 8 people (not 8,000) and all the quirkiness of a place that every class of students before and after me dreamed “if we ever get good and pack this place, it will be an unreal advantage”. It’s really quite amazing the emotional knee-jerk a physical place can evoke. You know what I mean. It’s like the indescribable smell of your childhood home that you can only recreate by entering it. I marvel at the ability for a place to strap you in the mental Delorean time machine. As I waited in the lobby, fully primed for a sentimental Sunday, my mind traveled to the spring of 1990. A naive high school junior from the smallest state in the union, I waltzed right in to Welsh-Ryan Arena with my dad, incredulous that my potential Northwestern, my dream school, played right HERE against THE Indiana Hoosiers and THE Michigan Wolverines. I remember vividly staring through the closed metal gates on the west side of the gym, thinking “I’m going to play here”. My memory lane whiplash was interrupted as former Wildcat center, Evan Eschmeyer, walked through the lobby. Then Kevin Rankin. Joe Ruklick, an NU basketball encyclopedia of knowledge (and the man who got the assist on Wilt’s 100th point) walked by. Julian Bonner was next. Tim Doyle and his pals with suitcases in hand strolled through as the crowd started to thicken. The former first family of W-R, the Falk family was next. This was no ordinary regular season game. It felt like a reunion, or perhaps a wake. Yes, that was it – a wake. But, not the sad “tragic death” kind, more of the 98-year-old full-of-life grandparent who left the world on their terms and wanted their memorial to be a raucous good time. And had arranged for a pre-paid open bar to boot. There was Michael Wilbon and J.A. Adande casually strolling in and I thought, for a moment, I could almost see their thought bubbles. Most had that same “soak it in” look I felt. Several former players like Esch and Rankin, are friends from my undergrad years. With the emotion of “The Pass” still carrying us through the week, the “where were you when?” of Wednesday night’s magical finish became the instant ice-breaker. Kevin Rankin, a season ticket holder, was on a Southwest Airlines flight returning home from a business trip having paid to get a radio broadcast (the Michigan version no less) when his phone battery died in the final five minutes of his flight. He missed it live, and only found out about it via texts and Twitter when he got off the plane and charged his phone to try and catch the finish. It physically pained me to hear this. A guy who gave everything he had every day and did it the right way, didn’t get to experience the moment live. Northwestern basketball’s home courts have a rather complex history in basketball lore. It became Welsh-Ryan Arena in 1983, where previously it had been McGaw Hall, a venue that opened in 1952 and hosted the 1956 Final Four (Bill Russell’s San Francisco Dons beat Iowa 83-71) and a 1967 NCAA Mideast final. The ‘Cats infamous hosting of the inaugural Final Four in 1939 took place at Patten Gymnasium, next to the current Patten Gymnasium (where Tech now is). I’ve written about McGaw Hall in the past, including several firsthand accounts of the place whose signature characteristic was a dirt track. The court was so substandard that former head coach, Tex Winter, took Kansas State’s old court and personally drove it from Manhattan to Evanston in the late 1970’s. The current (now former) Welsh-Ryan Arena paid homage to the dirt track with its mezzanine level “indoor track” when the last renovation (1982-1983 season) was completed. Then head coach, Rich Falk, took one of our best teams to the NIT by playing home games at DePaul’s old Alumni Hall (a harbinger of why I thought next year’s Allstate Arena home away from home was destined to be THE YEAR). He once told me he had the idea for the new arena pre-opening fundraiser where you could tag your seat for a modest donation and claim it as yours. Rich still holds the all-time NU single game scoring record in the arena (McGaw or Welsh-Ryan) and up until Sunday, had four of those purple seats he filled every game. How many fired coaches from their own school have that kind of loyalty? Every seat has a story. As part of my Wildcat Willy Wonka excursion, I had “N” Club status. Northwestern assistant Pat Baldwin spoke to the basketball alumni-dominated crowd that was elbow-to-elbow in a venue that might have looked posh in 1983, but looked more like a set of an 80’s throwback TV set. The mood was extremely relaxed. The air was filled with being on the other side…a collective “we made it” feeling. Pat spoke to the crowd and spoke from the heart looking directly at the 50-75 former players of all ages and repeated the “this is for you” mantra. Like most of us, Pat became emotional at moments as he reflected on the impact of Wednesday’s epic win. Our minds wandered. It felt like a “welcome to the other side” moment. 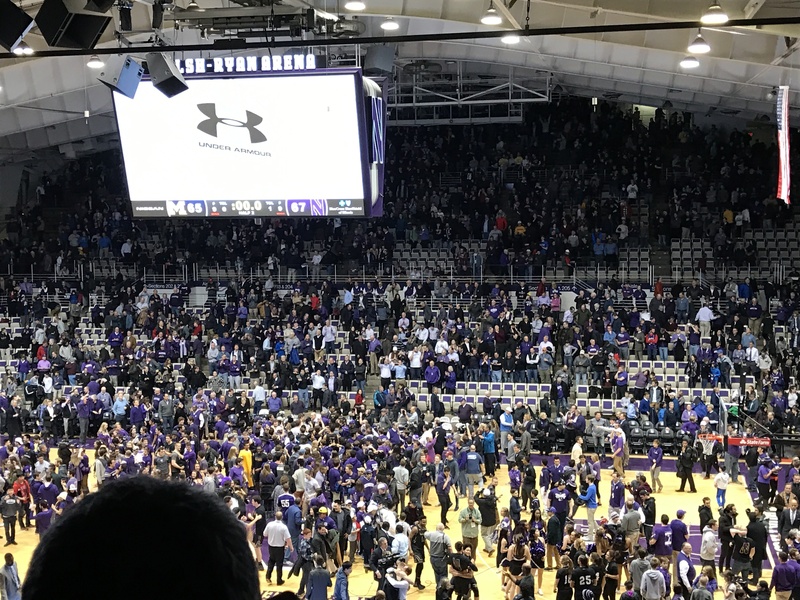 Nate Taphorn’s epic pass and Dererk Pardon’s unforgettable game-winning buzzer beater to beat Michigan 67-65 was the biggest moment in modern (post WWII) Northwestern basketball history but also the fan base’s biggest release valve in history. And man does it feel frickin’ great. What Pat may not have realized from the attentive audience was the collective thought was “no Pat, this is for YOU.” Pat Baldwin, enjoy your moment. Oh, the moment. The surreal nature of the “HOW” is equally as sweet as the “WHEN”. The improbable buzzer beater set off a catharsis of 78 years of pent-up frustration, the likes of which Welsh-Ryan has never witnessed. To have it be such a singular, unforgettable, indelible, improbable moment, well, it felt like a religious experience. 3.1.17 is the basketball program’s anno domino version of 9.2.95. A date we’ll wink to in every future year. It’s a moment my children (two of them anyway) and I will never forget. Pure unmitigated joy and jumping up and down screaming at the top of our lungs and mimicking the dog pile of purple in our own living room without even knowing a dog pile was happening on the screen because we did not see anything after the ball went in. I lost track of the number of times I rewound the moment. I now know every tenth of a second of 1.7 and will never forget it. As Baldwin fought back tears, I was filled with pride. “Northwestern-ing” had taken on a new meaning – one that had previously meant succumbing to “the moment” had now transformed to “we belong”. Our basketball challenges now become the hoops version of 1% problems. How do you book travel on selection Sunday? What’s the best way to get tickets? Whaddya mean schools don’t get a fan allotment? Are hotel rooms able to be canceled? What random city will a sea of purple descend upon? March basketball travel logistic issues. Behold the glorious moment. I looked at Baldwin and wondered how he could keep himself together in this moment. My mind raced back to 1992 when I was a sophomore trying to make the squad as a walk-on in the Bill Foster era. The very same Bill Foster who had coached Duke’s “Forever Team”, breaking through for that program the way our Duke-turned-Wildcat Chris Collins had just done. I would spend every day in the fall at Welsh-Ryan practicing with the team. I’ve never, ever faced a defender like Baldwin. He was incredibly quick, strong as a bull and made me realize daily that I was DIII material clinging to a DI prayer. I would be the last guy cut from the ’92-’93 squad. A fellow fraternity buddy, Tommy Kramer got the nod and for me, Welsh-Ryan from that day forward represented humility. You can give everything you possibly have to try and achieve a dream and have it come up short. It fuels me to this day. For Bill Foster, he never made it to 10 wins total in any of his seven seasons. One of the very good guys of basketball, Bill passed away, earlier this season. He would’ve loved this. For Baldwin, I bet not a day goes by when he doesn’t think about his three teammates, classmates (’95) of mine, who were implicated and found guilty of being involved in a reverse point shaving scandal. To be clear, this means they took money (and it was a tiny amount) to ensure we lost by more than the spread. And failed. When we covered in a game at Michigan, the wheels blew off the ruse that was architect-ed by a Notre Dame placekicker. It’s one of the most bizarre sports scandals of all-time and to guys like Baldwin and Rankin, who fought so damn hard for so damn long, pounding their own version of the rock, it makes them wonder, how close were they to being THE team. Another reminder of humility that old barn offered. Elite, not elitism, is the goal. No program, no matter how good intentioned is impervious to things going bad. The TV hoops stamp of NU validation, Jim Nantz. This was the basketball media coverage bucket list equivalent of Keith Jackson calling the 1995 Penn State game. Nantz & company are the college basketball validation stamp of legitimacy. On our campus in March? We have arrived. We belong. We are here to stay. I saw Bill Raftery getting prepped and again was mentally slung back to 1994 when he called the NU NIT win over DePaul, possibly the only fan setting in the team photo of this moment (Remember that opening tip Rankin dunk? It sounded like that for two straight hours against Purdue). Some 23 years ago, I was one of the student section knuckleheads who had stormed the court and raced to the TV bench and cajoled Raftery to oblige us with his signature audible catchphrase “with a kiss”. Man, where did the time go? When I actually got to my seat and sat down, it hit me like a ton of bricks. This was my view. As I realized the view from my seat for the final game it felt like destiny was on our side. Rob and I, along with every one we saw pregame, convinced ourselves the ‘Cats were going to play fearlessly now that they were devoid of THE pressure. Yet, emotions poured out in the most raucous senior day ever. Nate Taphorn’s arrival on the court with his family created a deafening ovation. Sanjay Lumpkin lost it and you saw grown men and women doing the casual “dry the eye without drawing attention to you” move. As the CBS team of Nantz, Grant Hill and Bill Raftery got set to go on air, the P.A. announcer alerted the fans to the timing of Welsh-Ryan about to go live on CBS’ telecast. Bedlam ensued. Aside from Pardon’s buzzer beater, this had to be #2 on the all-time decibel count of our home. You literally could not hear the person next to you. The moment every class of students had dreamed about, our often-maligned “high school gym” had become the home court advantage we knew it could be. The big question of the day was whether or not the ‘Cats would be drained by the emotion of the Michigan game and all the pressure before it, or would they be able to build on the momentum and compete with the Big Ten champion Boilermakers now free of pressure. Pregame chatter was banking on the latter. It didn’t take long to get the answer. The ‘Cats 16-3 run to go up 21-12 was again, a new record setter in sustained noise for our old barn. It was magnificent. The mild March day turned Welsh-Ryan in to a sauna, thanks to Wildcat fans packed in to the rafters. Reminiscent of early 1980’s June NBA Finals games at the Boston Garden, Northwestern had to open up the doors to let airflow in because it was so darn hot inside. Officials opened all of the doors to create a breeze to cool down the steamy Welsh-Ryan on her final day. Despite the fact a CBS game isn’t what it meant 25 years ago, there is no denying it is still a big deal. The next two hours played out like the best recruiting show we could’ve hoped far, sans the ending. Bryant Macintosh dazzled the nation with incredible poise, shooting and physics-defying drives to the basket. Dererk Pardon put on a stellar show against the likely national player of the year. Sanjay Lumpkin didn’t miss a shot all day and played incredible defense. And yet, Purdue showed incredible mental toughness and mettle by staving off a frenzied crowd to gut out a 69-65 win. You could argue it was the “best loss” we could’ve had to end an era, but that would be old Northwestern talk. Perhaps it was my proximity to the student section or more likely the fact this was my Northwestern basketball fantasy becoming a reality, but I bounced up and down throughout the game. I even transformed in to my 19-year-old self and turned around consistently raising my arms to get the lone rowdy holdouts – the purple seat folks – to try and stand. At times, even they did, defying decades of sedentary instincts. There are only so many ways you can say it – the place was absolutely rocking. It did feel like a Hollywood script ending was on. Down 59-50 and the game slipping away, the ‘Cats staged a furious rally that had the place going bananas. You simply can’t describe the crowd noise. I watched the game on TV when I got home and it didn’t come close to giving the atmosphere its well-deserved due. The bottom line is that the ‘Cats simply didn’t make shots when they needed to down the stretch. They went 0-10 from three in the second half. Scottie Lindsey’s in-and-out three, down 66-63, for a moment sent me in to the “why us?” mode, which I quickly course corrected by simply looking at “The Spot” of “THE PASS” right in front of me. With one last chance to tie it, Taphorn in-bounded from said spot and you felt…no way…this is going to happen. Again. Taphorn got the open look (though contested) we needed but on this night it wasn’t meant to be. Within seconds of the final horn, Northwestern workers started working hard to prep for the start of demolishing Welsh-Ryan. Fans lingered. Emotions were palpable, which is interesting for a venue that lay witness to an atrocious home record during the 1983-2017 era, an era memorialized by a beautiful poster that was handed to me not long after the final buzzer. In an eerie way, NU’s stadium history is intertwined with different eras – from the first Final Four in Patten in 1939 to the expansion to 64-teams in the “new-now-old” Welsh-Ryan of 1983 to….well…what’s next? I was too steeped in the milestone of the moment to look ahead. It was time capsule time. As I slowly strolled along the court I couldn’t help but take a photo of Dave Eanet signing off one last time from his courtside perch. Just feet away from where I called numerous college basketball games for WNUR in college – a connective thread for dozens of former sports nerds-turned-legit faces and voices of sports – from Eanet to Revsine to Greeny to Geffner to Rovell. The Ryan family was taking a family photo opp of their namesake arena. Sanjay and Nate had returned to the court for photo opps with their classmates, as it seemed almost like a clichéd, staged moment that “This. Is. College.” Welsh-Ryan’s transformation in to the new Welsh-Ryan is a sign of the times. Sleek stadiums arm races. Club levels. Personal seat licenses guised as “donations”. It’s the major college stakes of big time college athletics, a fine line that I believe no one walks better than Northwestern and Jim Phillips. No one. Sanjay and Nate soaking in a final few moments with their senior classmates. 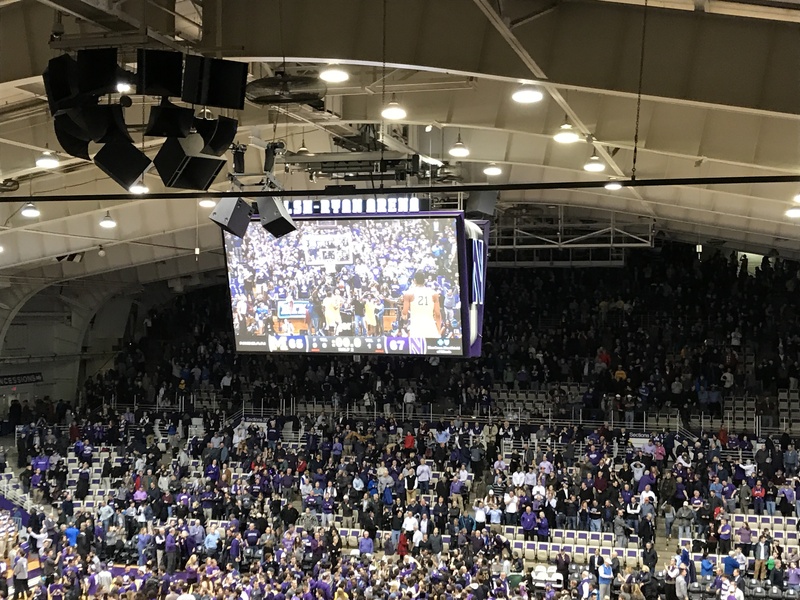 As I stood within earshot of the CBS tech crew, I heard one guy wrapping up cable tell a Northwestern helper “this is the loudest I’ve ever heard a college basketball venue and I’ve been to most of ‘em.” It felt like the disassembling of Welsh-Ryan was the NU hoops version of The Truman Show. That moment seemed staged for me, the Truman Burbank character, to hear and smile. Our arena, the bar of crazy home court atmosphere on the final day of its existence. I’ve actually often felt like we actually were the Northwestern basketball of The Truman Show. The rest of the hoops world was in on a reality gig whose plot pretext was “there is one team that we just won’t allow to taste March Madness…let us all gather and watch them suffer”. Taphorn’s pass and Pardon’s shot on 3.1.17 marked the end of that fake reality. Now, as the Welsh-Ryan set began to literally be taken apart, it felt like we had entered a new world. And if felt marvelous, even in the wake of a painful senior day loss. As I aimlessly walked around the bowels of the arena, I reflected on the fact this isn’t about my Northwestern journey, but that every Wildcat hoops fan has their own relationship with the place. I get that you may not care about my personal stories attached to our cozy gym, but I know if you’ve read this far, you’ve likely reflected on your own attachment to the place. A game. A moment. A feeling. Those get to come with us. Thankfully. But, with most things that change, or go away, there is a sense of loss, a sense of mourning. It was a day of mixed emotions. While I had camera in tow, it was the mental snapshots that will likely last much longer. The Welsh-Ryan floor was once a dream for my high school basketball self. It turned out to be a key part of my college experience – both as a fan who attended nearly every game in the student section from 1991 to 1995 – and as a player, winning a pair of intramural championships on that very floor. As a club basketball player, we played a game or two in Welsh-Ryan and even nudged classmate Rachel Nichols to write a story for The Daily Northwestern on our vagabond group of wannabe hoopsters. One day we’ll look back and wonder how we competed against the rest of the pack with a facility so lagging behind our Big Ten brethren. The quaint, quirky arena was our house and after 33 years it too now goes in to the time capsule of Northwestern basketball history at seemingly the perfect time. Stories. Above all, this is what we’re left with and what we look forward to. The dot connections that make seeing Chris Collins play in the Super Sectionals in the early 1990s to a packed house and the buzz of that game be a harbinger of what he would do as a coach on the very same sideline. His high school coach from that game moving one seat over to draw up a play that should be bronzed and memorialized forever in our new Welsh-Ryan. A play that so eerily mirrors the one that saw Chris’ father lose in controversial fashion to the U.S.S.R in the 1972 Olympics. Stories that connect us all through the sport so many of us dearly love. I’m so damn happy for all of us. But I’m happiest for every player who has come before these guys. Whether it is Kevin Rankin or Kevin Coble, Cedric Neloms or Andre Goode…the connective thread was that every one of them believed they could be THE TEAM that broke through. They shunned other opportunities to try and get the best of both worlds and worked their asses off every single day, yet never got to taste the ultimate reward. I can’t even imagine what it means to you since for me, today the world actually feels different. My outlook on life has changed. I’m instantly more positive and have an entire new filter for my Northwestern fandom. Welcome to the other side. We’ll miss ya Welsh-Ryan. Now, we brace for THE actual moment we’ve been waiting for – Greg Gumbel to call Northwestern’s name on selection Sunday. Not Northwestern State. Northwestern. Our Northwestern. It seems unfair that Welsh-Ryan won’t be open to host what would’ve been thousands and thousands of fans on Sunday evening to celebrate. The silver lining is that we’ll all be able to be at home manning multiple devices to purchase airfare, hotel and game tickets to a destination unknown. It’s basketball heaven time for Northwestern as we bury an era and an arena while raising the bar on a new level of expectations. See you in Tulsa. Or Sacramento. Or Buffalo. I don’t really care, but find a way to be there. It’s the moment we’ve lived for. Feel free to share your Welsh-Ryan memories here and we’ll be sure to keep in in the digital time capsule. Absolutely FANTASTIC story. Great to get your take on the Final Game. Great stuff. Your Wildcat perspective is missed. Maybe you could come back and post your thoughts a few times during the coming years. Hope so and thanks for your insightful thoughts throughout the years. Thanks Willycat – will do so on March 16/17 for certain. It is a joy to do so. Would be happy to..on occasion. Thanks Mark! I’ve received about 25 emails that are personal essays of other folks Welsh-Ryan moments. Unreal. Fabulous story. Miss the blog for writing like this. We crossed over during your time at NU (I was a grad student from 92-96), and I still vividly remember the DePaul NIT game. I’m glad the old barn went out with a bang (or two), and look forward to the atmosphere when it is reborn in 18 months. Have fun on your travels in 9/10 days! Thanks drosejr – amazing how our own experiences hold up the test of time. Wouldn’t trade that ’94 NIT run for much…it was a fun finish. Thanks! Love reading the stories. My buds and I held the DePaul Rankin dunk as the measuring stick for loudest moment ever in that arena…until last month. Yes, it was loud that night. I hit my head on the concrete rafters in the upper deck at that point! Disappointed it only made #9 on the NU list of top moments in WRA history. No doubting #1 now! This is the recap I’ve been looking for. Thank you. Thanks for this write-up, LTP. I know I am speaking for many in saying thanks for this piece and we miss your blog. You have summed up my feelings for our alma mater, its athletics program, and the great people who represent it on the court. I love that picture of Taphorn and Lumpkin with the rest of the student body! I will be down in DC Thursday night with my roommate from the Class of ’89 and will be ready to travel anywhere the Cats go the following week. Again, thanks for articulating your love for the program so eloquently and spending all that time on the LTP blog. Go Cats!!! Thanks for the awesome note. Much appreciated. Get us to SATURDAY in DC! Bring us a win in DC!!! Goosebumps…it’s a long way from the 82-83 season in Mem Hall my Jr. year. Enough said! Tears. Thanks so much LTP. This is the best of the many Welsh-Ryan retrospects. I worked court side on the stats crew for Sports Info from ’84-’88 (only real highlight was incredible win over Indiana in ’88). I was back for a game last year. The place really hadn’t changed much at all. Go Cats! See you in Buffalo or Salt Lake….. Thanks Dan. The change in atmosphere in Feb/March was impossible to capture with the written word. Man..love that! Tears! Ultimate paydirt for me. Thanks for one more post, Jay. Unfortunate that this was the one year life interfered with season tickets, but I’m glad you made the Purdue game. A brief alumni event earlier this year with Chris Collins convinced me to finally step up and get a full season package (I did get a six game package, last year), and I’ve been having the basketball time of my life ever since following this great group of young men. Hopefully, the changes to WR will only enhance the comfort without losing the charm. I’ll see you at Tulsa… or Milwaukee… or Greenville… or wherever. I’d like to think my absence contributed to the success! I’m as superstitious as they come. Nah…my absence contributed to the winning this year..or at least that is my rationale. Thank you and welcome back. My favorite W-R memory (I wasn’t there for the DePaul NIT game) was the win over Illinois when Cedric Neloms stole the ball from Deon Thomas and hit a buzzer beater from half court. That’s a distant second, of course, to THE PASS vs Michigan last week. It’s been quite a week and a season, and the best part is it continues AFTER the Big Ten tournament! Thanks Greg…my personal fav moment as well until THE PASS. I ran home on that frigid February night so psyched and my hometown girlfriend broke up with me that night when I called her to share my excitement. It was the ultimate “Cats fans can’t have nice things” indoctrination. Love your blog. Miss it so much. My favorite memory was my senior year watching NU beat Notre Dame on St. Patricks Day in the NIT. Going to DePaul that year to see the Wildcats play, I had the same exact thought you did that next year would be the year since I believe if the NCAA tournament had been 64 teams my senior year we would have made the tournament. The first event in the sparkling new Welsh-Ryan arena was my graduation. What a senior year; breaking the football losing streak with a win over Northern Illinois and then Minnesota followed by our amazing basketball season at DePaul. Success is so much sweeter at NU! Thanks Michelle. I know until lately that ’83 team was the modern era gold standard of “best teams”. The atmosphere at Rosemont looked insane. Hoping it looks that way next year. Fellow class of 1995 alum here. Great write-up! I played in the basketball band and went to most of the home basketball games from my sophomore year on, including some of them that fell on winter or spring break (my friend Vic and I would drive down form Wisconsin to play for the Cats games, including the 1994 NIT game vs Xavier that fell over sprig break). Plus the Women’s NCAA tourney in 1993 when NU got an at-large bid and played Georgia Tech at W-R (they next lost at Tennessee, and I got to go to it as part of the band, but at least I can say that I got to see Pat Summit coach a game). In January 1994 I was diagnosed with kidney failure and got so depressed that I would only leave the house to go to class or go to the basketball games. My health and grades were failing, but W-R was a reprieve from my horrible reality. As I am writing this I obviously lived and graduated – got a kidney from my mom in the summer of 94, and even passed all of my classes! Thanks for the memories Welsh-Ryan. I’m so excited to follow the Cats around this spring. I’m leaving right after work to fly to DC for the Big Ten Tournament, and I am looking forward to the national tourney! And YOU win for most dedicated Welsh-Ryan fan. WOW. I do remember that ’93 win over G-Tech when the women crushed ’em. It was awesome. We had such a blast and I was so happy for my bud, Mo Holohan. THanks for pointing that out as that was the best women’s moment in arena history. So glad you are OK..what an amazing story. Thanks for sharing. Awesome article! I don’t have one favorite moment / game from Welsh Ryan, but it certainly holds a lot of memories. I was in the Basketball Band from 94-98, and also covered sports for The Daily so I spent many nights up at Welsh Ryan. It’s also where I received my diploma, as the Tech ceremony was held in Welsh Ryan the year I graduated. I’ve been back to Evanston for several football games, but only once for a basketball game (we actually watched NU beat Illinois at Soldier Field, then hurried up to Evanston to watch the Cats beat Univ of New Orleans in 2015). So, as much as I look forward to the “new” Welsh Ryan, I will always remember how integral a part it played in my Northwestern experience. I probably won’t make it to the tournament since I’m currently living in Norway (although, if we make a run deep in the tournament…) Go Cats!!! And thanks again for all your work on the LTP blog! I’m in Oslo from the 18th. If NU makes it to the first weekend, need to find a place to watch the game. Any ideas? I recommend you buy a Slingbox for $100, hook it up and test it a few times prior to the game. I have watched NU hoop games this season from Korea and India. Aside from an issue with the display width / height for the MSU game I was able to watch at least 5 games successfully. When you combine it with DVR it’s amazing how far we have come video-wise (and NU athletics-wise) in the past decade. You will probably not be able to watch your DVR or the CBS broadcast from Norway. Even the radio feed has been more difficult to obtain, at least from Asia. BTN works, but other feeds don’t. I would recommend downloading the CBS March Madness Live app before getting to Norway (you can do it from here, but you have to go in and mess with the Google Play / App Store settings). I was able to download it yesterday. Also, pay $5-$10 for a VPN service like ExpresVPN so the app will work here in Norway by getting around the geographic restrictions. There likely won’t be any bars showing the game.. I’m in Stavanger or I would invite you to come watch at our place. Thanks for that info! Didn’t realize that TV apps like that were restricted based on location. Would I be able to get a feed on my laptop as opposed to an app? Will probably only watch if the game is at night Norway time, since we’re on vakay, and I’ve never been to Oslo. Great recap of the night! Can’t wait for future great memories this season! Man I miss LTP. Thanks again. And it’s great that Welsh-Ryan is hosting a watch party Sunday night. im so happy I check back every now and then. Thanks! This was the “Jack Buck/Kirk Gibson 1988 World Series” moment of my sports loving life. I CAN NOT BELIEVE WHAT I JUST SAW” that night! One other moment from the Old Welsh Ryan comes from a couple of seasons ago when we rode Tre Demp’s 3 point shooting barrage in late regulation and overtime to a 2OT win over Michigan. From McGaw Hall it would be a 99-87 win over #2 Michigan (at the time). Billy McKinney was something else on that cold January Saturday night in Evanston! The name Lake The Posts is a nod to the past (pre 1995) of Northwestern football when students would rip down the FG posts after ANY win and march them the mile east in to Lake Michigan. The term "lake" is a verb around Evanston and students would chant "Lake The Posts". If you have feedback, tips, questions or opinions you'd like to share contact us at laketheposts @ gmail dot com. Help keep Lake The Posts up and running... and growing! Your contribution—whatever you're kind enough to give—will help make LTP a community that can continue to grow and better serve YOU! Watch the game with purple-clad fans in your city! Lake The Posts is a Northwestern fan community. If you have feedback, tips, questions or opinions you'd like to share contact us at laketheposts @ gmail dot com.